Edgar Meneses, originally uploaded by A. Sofia Silva. And this turned out to be a nice afternoon/evening after all! I have been going through a rougher time, so I haven’t been shooting much lately. So, today some friends gathered and took me for a nice “Chat & Shooting” session. We went to the Botanical Garden and then to the beach. Will probably post some portraiture here later! Aeroporto / Origins Of Symmetry IV, originally uploaded by A. Sofia Silva. It can be a peaceful place, an Airport. 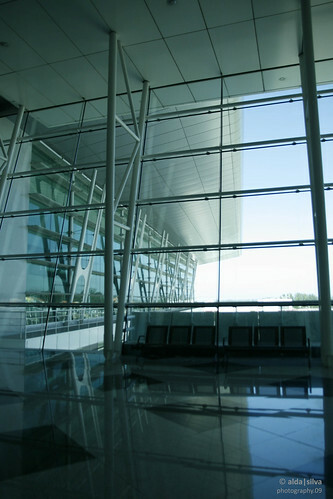 This one has an astonishing architecture and is considered the Most beautiful European Airport. Another weekend out means (maybe!) some pictures to post. And what a lovely weekend out in Gerês, a National Green Park, which includes a reserved, protected area. Contact with Nature, relaxing, walking and exercising… sweet. Shot a bit, but I guess that wasn’t my priority – a bit unfortunate when the landscape is as stunning as that one! Will get back here later! Just a wee bit of what I’ve been doing over there. I have visited the Francisco Sá Carneiro Airport (Porto, Portugal) lately, since I have been spending too much time at home and I took some shots worth showing. I’ll select some and put them online here later (tomorrow or so will be fine for that). Nevertheless, I am willing to shoot portraits over there. It’s a very nice space and it’s full of feelings. What is seems to be, may not be it at all.